Most, if not all, creativity can be explained as novel combinations of pre-existing ideas or objects. In the early 20th century, a varied combination of representational art and technical drawings (viewing objects from different angles) gave birth to cubism. Shortly thereafter, Coco Chanel combined the practicality and silhouettes of menswear with women’s haute couture. And then Pollock combined the idea of indirect observation (common in the sciences) with painting, using the canvas to project events in higher dimensions with paint as a medium. Whether they thought about their work this way or not is beside the point. Not just any novel combination of pre-existing ideas or objects will do however. Substituting the candles in an oversized birthday cake with AK47s would be a novel combination, but hardly great art. Someone might argue that the “tension” created by candles that symbolise life lived and AK47s that can take life has meaning, but that’s simplistic. Why? Because the combination lacks depth and compactness. Depth refers to how much room for exploration there is within the bounds of the work. Allowing exploration far outside the bounds of the work is meaningless – all works would allow for the same explorations, differing only in their starting points. Compactness refers to how conceptually close the objects or ideas combined are. This matters because a novel combination of things that are conceptually close tends to challenge the status quo (or the combination wouldn’t be novel). Also, novel combinations of conceptually close concepts are rare compared to novel combinations of disparate things, and scarcity attracts. For example, painting and technical drawing are close concepts in technique (putting colour on a canvas) and objective (depicting an object or idea). Picasso’s and Braque’s novel combination of the two enabled explorations of both form and meaning. The concept of plotting observations of an event – think about the trajectory of a bouncing ball – is close to painting in that they both project a higher dimensional observation to two dimensions. Pollock’s indirect plotting of his three dimensional movements combined with with abstract art (or sculpting if you want) was novel. Chanel’s combination of menswear and womenswear is today so common (and seems so obvious) that it is hard to imagine that it was novel. When concepts so close are considered novel, it hints at unexplored space in the reasons why and fashion is still exploring the boundaries between the sexes. This brings us to the cottage in the lake. 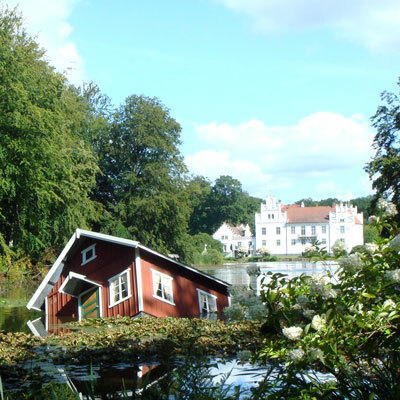 Wannås Slott, a park for modern art exhibitions in the south of Sweden, had a red-and-white cottage in a small lake and with sound coming from inside. It is a good example of bad art. An out-of-place object is the simplest of novel combinations; putting something out-of-place makes it novel by definition. You can do it with any object. Put a guitar in an aquarium, a rock in a womb, or a megaphone in outer space and you have novel combinations. Dead simple, infinitely variable. A cottage in water is a trivial out-of-place object. In front of the lake was a bench. After sitting on it for a while it suddenly shook. A bench, usually intended for rest or contemplation was combined with startling movement. Movement combined with rest is well established in cradles and rocking chairs, but startling movement is novel, especially in the setting of an idyllic park. Is it great art? No, but it is decidedly better than a cottage in a lake.